(1452-1519), Florentine artist, one of the great masters of the High Renaissance, celebrated as a painter, sculptor, architect, engineer, and scientist. Leonardo da Vinci profound love of knowledge and research was the keynote of both his artistic and scientific endeavors. His innovations in the field of painting influenced the course of Italian art for more than a century after his death, and his scientific studies�particularly in the fields of anatomy, optics, and hydraulics�anticipated many of the developments of modern science. Although Leonardo da Vinci produced a relatively small number of paintings, many of which remained unfinished, he was nevertheless an extraordinarily innovative and influential artist. During his early years, his style closely paralleled that of Verrocchio, but he gradually moved away from his teacher's stiff, tight, and somewhat rigid treatment of figures to develop a more evocative and atmospheric handling of composition. The early The Adoration of the Magi introduced a new approach to composition, in which the main figures are grouped in the foreground, while the background consists of distant views of imaginary ruins and battle scenes. Leonardo's stylistic innovations are even more apparent in the The Last Supper, in which he re-created a traditional theme in an entirely new way. Instead of showing the 12 apostles as individual figures, he grouped them in dynamic compositional units of three, framing the figure of Christ, who is isolated in the center of the picture. Seated before a pale distant landscape seen through a rectangular opening in the wall, Christ�who is about to announce that one of those present will betray him�represents a calm nucleus while the others respond with animated gestures. In the monumentality of the scene and the weightiness of the figures, Leonardo reintroduced a style pioneered more than a generation earlier by Masaccio, the father of Florentine painting. The Mona Lisa, Leonardo da Vinci's most famous work, is as well known for its mastery of technical innovations as for the mysteriousness of its legendary smiling subject. 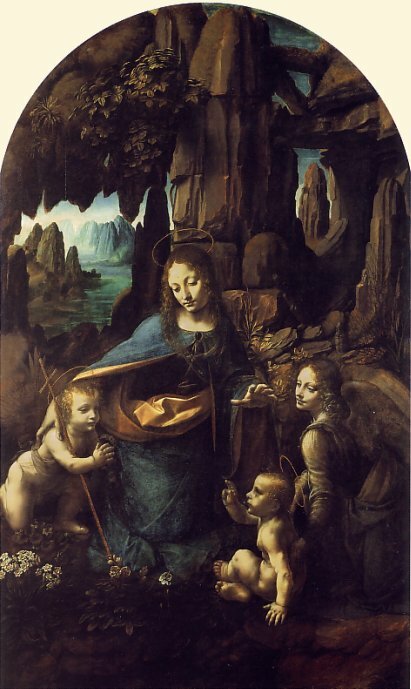 This work is a consummate example of two techniques�sfumato and chiaroscuro�of which Leonardo was one of the first great masters. Sfumato is characterized by subtle, almost infinitesimal transitions between color areas, creating a delicately atmospheric haze or smoky effect; it is especially evident in the delicate gauzy robes worn by the sitter and in her enigmatic smile. Chiaroscuro is the technique of modeling and defining forms through contrasts of light and shadow; the sensitive hands of the sitter are portrayed with a luminous modulation of light and shade, while color contrast is used only sparingly. An especially notable characteristic of Leonardo da Vinci paintings is his landscape backgrounds, into which he was among the first to introduce atmospheric perspective. The chief masters of the High Renaissance in Florence, including Raphael, Andrea del Sarto, and Fra Bartolommeo, all learned from Leonardo; he completely transformed the school of Milan; and at Parma, Correggio's artistic development was given direction by Leonardo da Vinci's work.